My name is Colin Johnson and my learning curve for computer graphics and digital video started way back in 1993 when I was fortunate enough to be commisioned to design an audio visual experience for Dudley Castle here in England. The brief was to use the latest computer graphics tools to create a 3D model and visualisation of the Castle as it was in 1550 when John Dudley, Duke of Northumberland was one of the most powerful men in the country. This project took on an added challenge when it was announced that HM Queen Elizabeth II was due to open the visitor centre in less than twelve months and my system was set to be a centrepiece of the complete historical interpretation. Planning for a royal visit must be a logistical headache for the Royal household security and full details of the system had to be supplied months before the opening, and the title I gave to the system was 'Virtual Tour' being a cross between 'Royal Tour' and the pioneering use of 'Virtual Reality' applications. 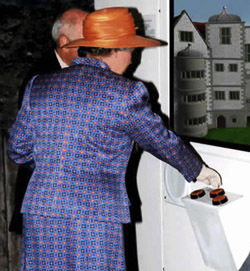 With finger at the ready is a local dignitary guiding Her Majesty to the start button. 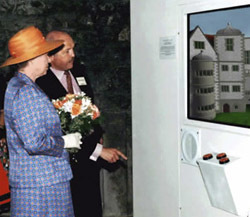 June 1994 and pressing the forward directional pushbutton Queen Elizabeth II became the first ever user of a Virtual Tour experience. Soon after similar systems were installed around the UK, mainly in heritage and museum centres. This gave me a unique opportunity to observe and learn how a wide cross section of the public reacted to a user experience through computer graphics. An archive of the original Virtual Tours project can be viewed here..